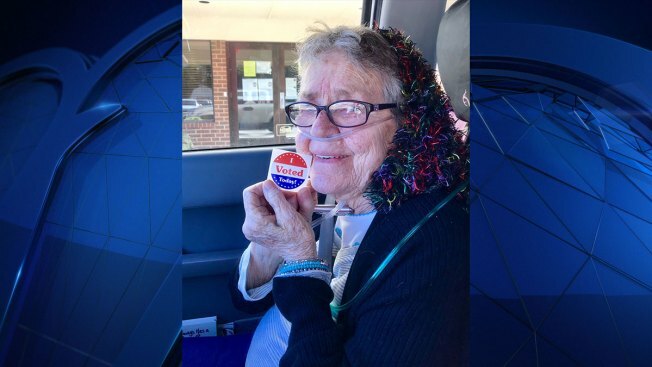 Gracie Lou Phillips, an 82-year-old North Texas woman who voted for the first time in her life last week, died surrounded by family members early Monday morning, her family confirms. “Her priority through life was her family,” said granddaughter Leslie Rene Moore. They say political vitriol drove the great-grandmother to vote in Grand Prairie on Thursday, despite transitioning into hospice care. Phillips’ proud moment was captured on video where she is seen holding an "I voted today" sticker, reading each word out loud. “To have someone literally need oxygen to breathe, pure tank of oxygen to breathe, put it in her car and ask to go on what may very well be the last week of her life, that shows the dedication and priority that people need to look at,” said Phillips. Phillips' family hopes her deed inspires others on Election Day. “To know that her voice is going to be heard forever is really exciting for us and we’re really proud of her,” said Moore.